The CEO of your health: are you ready to lead the charge? Melissa Scribner, the US employee benefits manager for Boston Scientific in Natick, MA, a global medical device company. Joan Benoit Samuelson, an Olympic Gold Medalist, marathon runner, road race founder and organizer. The ideal healthcare consumer is one who cares enough about themselves to get the right care, of the highest quality, at the right time, at the right cost. He/she develops a partnership with her physician and is comfortable asking questions. They plan ahead for visits with theirdoctors outlining a different objective depending on whether the appointment is for a yearly physical or a “sick” visit. Even if a topic is uncomfortable and unpleasant, the healthcare consumer is frank and to the point. The ideal healthcare consumer knows themselves, the community of support around them and trusts his/her instincts when making decisions. An ideal healthcare consumer is one that tells the physician what they need to hear, not what you think they want to hear. Sometimes, information overload makes it challenging to discern information that is relevant and valid. The complexity of our healthcare system is an obstacle that requires simplification. Women appear to be better at multi-tasking. Priorities change throughout life, but what is essential is that women take time for themselves every day. Exercise is a wonderful way to stay fit and work through stress. Even with children and a job, everyone needs to find time to do some form of exercise and to work on eating right thus balancing mind, body and spirit. Be passionate about everything you do in life, try to achieve balance, and run your own race. Partner with your physician and be their backup, after all, you are managing the health of a few people and they are managing the health of thousands. Studies identify that 80% of patients know their diagnosis before seeing their physician, so be sure to let your physician know what you are worried about. Prepare for appointments, always ask questions and do research/homework ahead of time. Your participation in the process will lead to improved satisfaction and improve your compliance with a mutually agreed upon plan of care. I found the discussion rich and stimulating because when advising clients who are accessing healthcare, I am often explaining the perspectives of the multiple stakeholders involved, including that of the provider, the employer and the insurer. Our mission at Healthassist is to empower individuals to take control of their own healthcare by understanding the disparate views of those involved and then making the best decisions for themselves. Whole person orientation; it recognizes that all of a person’s health care needs must be addressed at all stages of life including acute care, chronic care, preventive services and end-of-life care. Care coordination / integration; it recognizes that when accessing care, people need help coordinating that care across all elements of the health care system (e.g., specialty care, hospitals, home health care, long-term care) and the community (e.g., family, friends, employers, insurers, public and private community-based services). As the discussion surrounding reducing health care costs continues, it is important to recognize that approximately 80% of healthcare costs are generated by 20% of the population. Clients who call us at Healthassist are often in the category of high cost because they have multiple chronic conditions and complex medical histories and require care from multiple specialists. But the sentiments they are often communicating, especially at a moment of crisis, are not necessarily about high cost, but more confusion and frustration as they attempt to navigate their own care or that of a loved one. A common phrase we hear is “the left hand doesn’t know what the right hand is doing”. 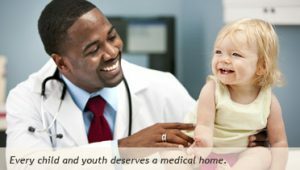 As the patient centered medical home model evolves, it is our hope that a primary care practice that includes a whole person orientation and pro-active care coordination will lead to satisfied consumers receiving the right care, of the highest quality at the right time, at the right cost. In 2004, when Healthassist was founded, whole person orientation and care coordination were the building blocks of our approach. We recognized that healthcare consumers needed to be at the center of the healthcare equation and that care was influenced by many more factors than a brief interaction with a provider. We knew that coordination and integration demystified the healthcare system, relieved the devastation, fearfulness and confusion often felt in the middle of a healthcare crisis and were key to an individual’s total experience. It is why our approach to advising clients is personalized and customized to individual needs and takes into account your preferences. 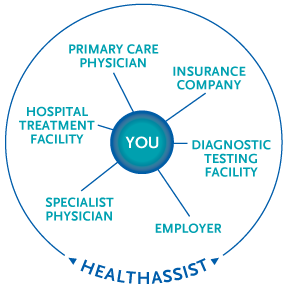 We see ourselves as the circle that surrounds all the people involved in your care including most importantly you at the center, physicians, nurses, care managers, social workers, insurance professionals, and employers. With our experience, we are able to relay to you, the different perspectives from which all the players view the situation at hand so that you can confidently make the best decisions for yourself. When and if the need arises, contact us so we can work with you to assess where Healthassist can help you and your family.